Some parents dread it, others can't wait - Christmas Vacation is almost upon us!! Keeping the kids busy is another thing. Here are some ideas for having a productive and fun filled Christmas Vacation with the kiddos. Instead of wishing they were going back to school, you'll be wishing it would last just a little bit longer. And if you don't have any kids in school yet, like me - don't fret! These ideas will make your holiday season britghter, too! The best part about having a family tradition is that it is something to look forward to. The world and our family will change over time, but tradition is typically something that you can count on happening and staying the same. A little bit of Christmas comfort, if you will. Growing up my family had the tradition of going to my grandparents house for Christmas Eve, and my grandmother would hide a little present in the tree that each of us kids were to find. We would open two or three gifts that night, and it would officially kick off our Christmas day. I remember going home and rushing to bed because I couldn't wait for Santa to come. These days, we don't have any family traditions with our daughter yet (as she is only 13 months old), but we have started a family tradition. 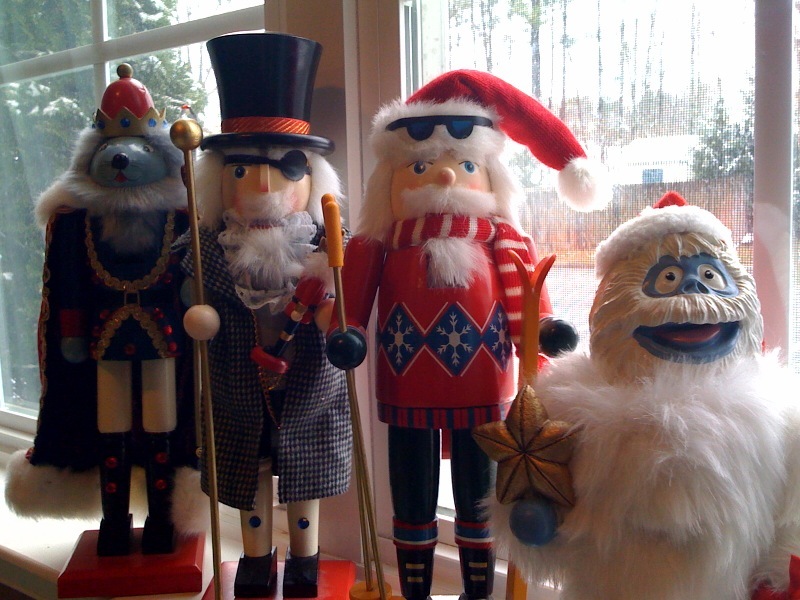 Four years ago we decided to start the tradition of purchasing a nutcracker each year. On the bottom of said nutcracker is our names and the address we lived at when we first purchased it. It has been so much fun each year opening our bin of holiday decorations and looking at each of our nutcrackers. Even more fun is purchasing a new one each year!! Ask your kids what holiday traditions they would like to start, and make it a family project! Pick out a family ornament every year? Have a holiday movie marathon with each person picking a movie? The Dollar Store is a perfect place for kids to purchase gifts for each other. Armed with a list and $5, what can your child find that their brother or sister will love? Children are really good at remembering all of the people in our everyday lives that we sometimes forget about... the mail carrier, the cashier that is always working when we shop, the veterinarian. Ask your child who they would like to give Christmas cookies to this year. The love and thought that a child puts in to decorating a cookie will keep the Christmas spirit going through the New Year. Help your child deliver the cookies and spread smiles! Don't let your kids off the hook too easily. These days, a lot of kids view Christmas Vacation as unlimited video gaming, staying up late, playdates with friends every single day, and the obligatory family gathering sprinkled in here or there. Just because school is out doesn't mean that the learning has to stop. During your child's break, try to have an least one educational outting to a museum or library, and make it fun! Do your research ahead of time and find out if there are any materials that go along with museum exhibits (many science museums, for instance, have this!) If your child is older, consider a community service field trip. Serving others at a soup kitchen is a wonderful way to teach your older children about the meaning of Christmas and giving to others. What are some of your favorite things to do during the Holiday Break? Please share!!! Great ideas Holly! I love the dollar store idea especially!